Those are the opening words to the title track of Taking Pride in the Inland Northwest, a record of eight songs swelling with a completely un-ironic brand of boosterism that promises "the future is now," "love is our thing" and "there's no better place to be." This album came across my Facebook feed after a friend found it at a thrift store, its frowning sepia-tone cover children still wrapped in cellophane. "If anyone knows what led to the creation of this beauty, please share," he wrote. "This album is my white whale." From the TV-announcer narration to the big ad for Empire Ford on the back, this discarded artifact is, at worst, an awkward marketing campaign by someone who thought that a vinyl record was the best way to sell Spokane, even in 1991. In a different light, though, it's a charming reminder of the kind of pride our area has in its own beauty, the way we're always trying to convince others this really is "a special place to be." An Internet search shatters that charm. It turns out that Impact Broadcast Marketing, the company that partnered with KREM-TV to make the record, takes pride in plenty of other places too: Topeka, Dayton, Portland, Peoria, Maine, Wichita, Cedar Rapids, Nevada, San Antonio, Rochester, Asheville, Omaha, Georgialina, East Tennessee, Central Florida, Four States, Eastern Carolina. Throughout all of these Taking Pride records, with the exception of the narration between tracks, you'll find the same lyrics in the same songs, only two of which actually mention the place in which they're taking pride. On a track called "This town" (We've built a town we can be proud of / Neighbor helping neighbor in the spirit of love), there's no actual mention of which town. The same goes for "This City's Moving" (This city's moving / Right up to the top / This city's moving / The heartbeat never stops) and "Love Your Lady" (Love your lady / She's your town / Treat her right / And don't let her down). In my research, I found people who used to work for the Nashville, Tennessee-based Impact Broadcast Marketing company (which now appears to be nonexistent) and for the studio where the album was recorded, but got few responses. I was handed off to different employees at KREM, but no one seemed to remember the effort. Staff at Visit Spokane and Greater Spokane Incorporated hadn't heard of the album and didn't know anyone who was at those organizations two decades ago. No one, it seemed, would be able to answer my many questions. 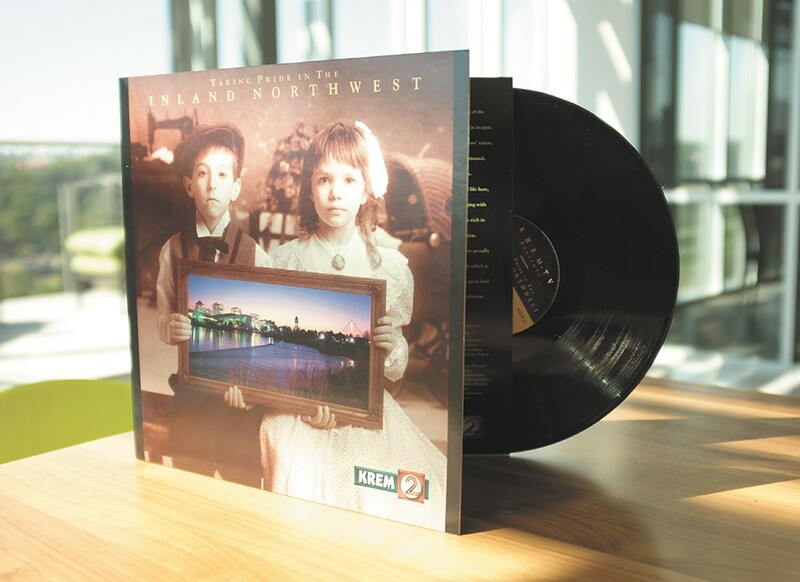 Yet, even though she hadn't heard of this album, Visit Spokane Chief Marketing Officer Jeanna Hofmeister wasn't surprised by it. "Who doesn't want to be friendly and beautiful and all the things we pride ourselves on being?" Hofmeister says. "Every community wants that." The songs' generic vagueness may be exactly their point. "Taking Pride in the Inland Northwest" may be just like taking pride in Topeka or Nevada or Central Florida. Even Spokane's signature slogan — "Near Nature, Near Perfect," a mix of natural beauty and urban sophistication — is not so different from other places. The narration on Taking Pride in Topeka describes that city as "capital city; Hometown, USA; the perfect blend of big-city convenience and small-town friendliness." Promotional materials from the '50s and '60s proclaim Spokane a "paradise for vacationers" and "sunshine land." One brochure calling it the "Hospitable Center of the Pacific Northwest Vacationland" promises: "If you have not visited Spokane, you'll find its ready-made vacation possibilities almost incredible." A 2009 Visit Spokane video called "This is Our Place" promotes the Fox as "our Carnegie Hall" and Arbor Crest as "our Tuscany." But over time, the approach has become more realistic. Even those who promote Spokane seem to empathize with those things we've all felt: the inferiority complex; justifying our choice to live here; the hard-to-explain strangeness that doesn't quite rise to the marketable level of the weirdness in a place like Portland. Instead of the perfect destination, the Spokane pitch now is that you'll be surprised at what you find: craft breweries, a symphony, an Apple store. "We don't sell ourselves as 'the nice city' or that kind of thing," Hofmeister says. "We try to position this area as unexpectedly cosmopolitan. You'll find more here than you were expecting."